Have you ever order lobster in a Chinese restaurant? The Chinese has its own way in preparing and cooking the lobster. Most people are used to cook lobster in boiling water, check out my past blog post: Lobster with Pasta and Spicy Lobster. The Chinese first cut the lobster into pieces and isolate the tomalley (green substance) and roe (black stuff similar to caviar) which will be cook separately. The tomalley and roe are first steamed in order to fully cooked them (roe becomes red when fully cooked). 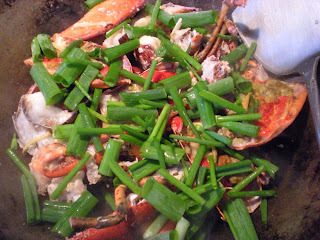 The lobster parts are then stir-fry in a wok and the tomalley-roe are added afterward. It is common to deep fry cooked lobster, but this step is optional. IMPORTANT: Almost every part of the lobster are edible, except for the head sack behind the lobster eyes. Remove the black veins found at the bottom of the tail. I think that is about it. Let me know if I missed anything. 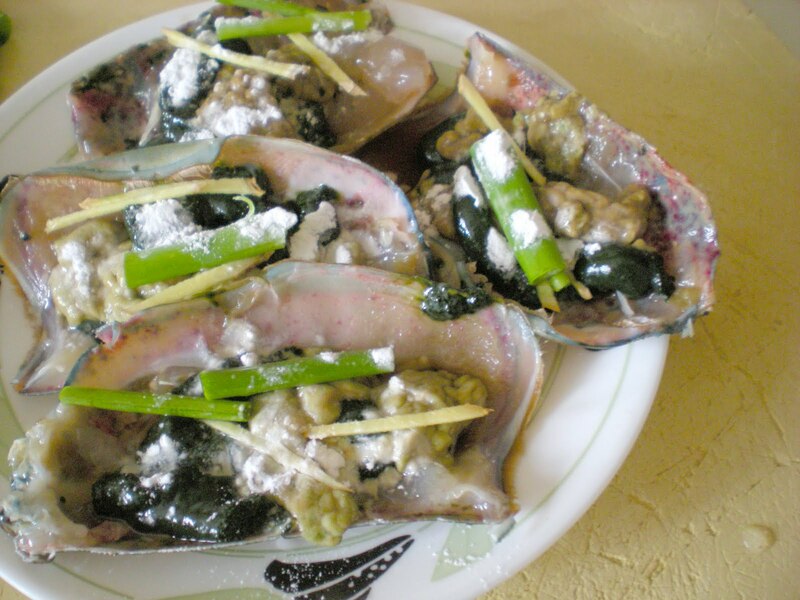 Here is a crush course on how to prepare lobster, the Chinese way. If needed, click here for the anatomy of the lobster. Be aware, this is one of the messiest preparation, better do it outside. Check out the step-by-step pictures for guidance. 1. 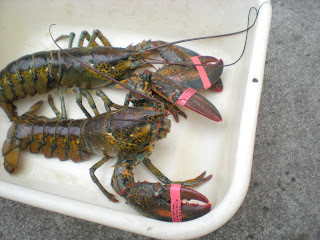 Make sure that the lobster is fully clean before cutting. 2. 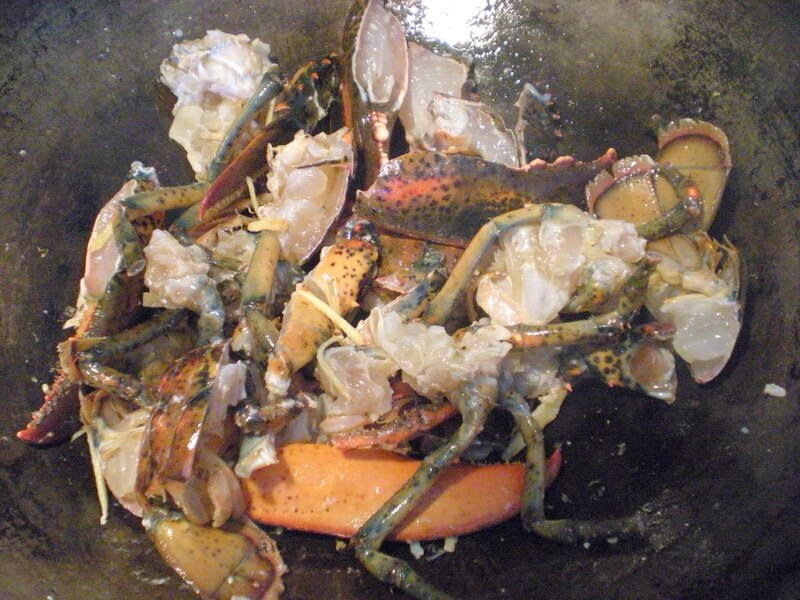 Using a butcher knife or sharp chef's knife, cut lobster in half at the abdomen. 3. With the abdomen/tail, discard black veins, reserve the roe and chop into 4-6 pieces. 4. With the top part, chop arms and claws. 5. Using both hands, separate legs from its top shell. 6. With the legs, reserve the tomalley (green substance) and cut the ends of each leg. 7. With the shell, discard antennas, head sack and eyes. 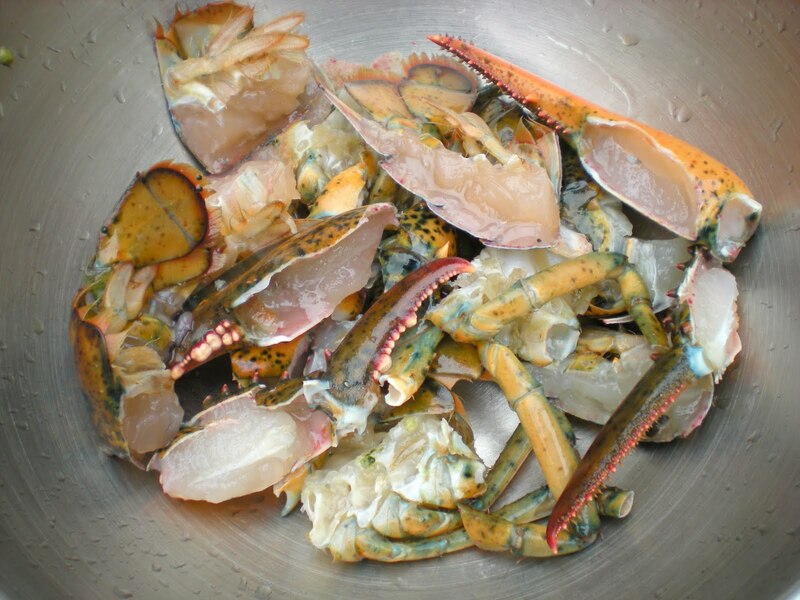 Cut the shell in half lengthwise which will be used as a holder. Place tomalley and roe on both shells. 1. Place 2-3 scallions, ginger and a pinch of cornstarch over each tomalley-roe. 2. Steam for 5-10 mins until roe is fully cooked. Set aside. 3. In a wok, heat oil over medium-high heat. 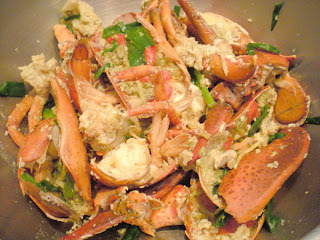 Stir fry ginger and lobster until the shell turns red and meat turns white, about 5-10 mins. 4. Add in tomalley-roe and scallions. Stir fry for 1-2 mins. 5. Add soy sauce, rice cooking wine, and about 1/4 cup water to prevent from drying. Cover for 2-3 mins. Serve. Wow, now this is a decadent meal! Simply gorgeous. This looks incredble Victor! 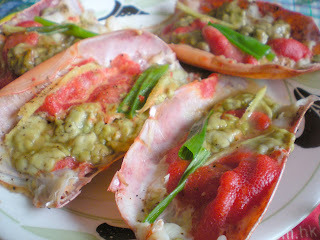 Lobster is one of my favorite dishes, this post was a treat for me to read! Wow very different from what I know. Great recipe. Love the ginger and scallions in it. Hmmm great recipe, beautiful dish! This looks wonderful.....I would love to eat it now !!!! You spend less while learning if you make this recipe at home. You really know how to prepare lobsters. It may be expensive, but I will definitely try to cook this recipe. I just hope my wife will love it.